Sometime back I blogged about Abdalrahman Zeitoun. Dave Eggers has accomplished a rare feat this week: He simultaneously made the L.A. Times nonfiction and fiction bestseller lists. His nonfiction book "Zeitoun" is the story of a family in New Orleans before and after Hurricane Katrina. When he began his book tour in August, he packed Skylight Books in Los Feliz to overflowing. People stood outside on the sidewalk, as if there were speakers out there to enable them to listen (there weren't). "Zeitoun" is currently at No. 7 on our nonfiction bestsellers list, where it's been for seven weeks. A film version of a book about a man’s true-life experiences in post-Katrina New Orleans would seem sufficiently pregnant with artistic possibility. Still, Jonathan Demme plans to take his adaption of “Zeitoun,” the best-selling Dave Eggers work, one step further by making it as an animated feature. On Wednesday, Mr. Demme (whose films include “The Silence of the Lambs” and “Rachel Getting Married”) said that he had acquired the film rights to “Zeitoun,” whose cover illustration by Rachell Sumpter had inspired him to make it into a cartoon. 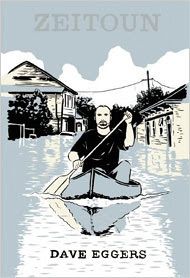 The book by Mr. Eggers (a co-author of the screenplay for “Where the Wild Things Are”) tells the story of Abdulrahman Zeitoun, a Syrian-American man who remained in New Orleans after Hurricane Katrina to protect his home and business, and paddled its flooded streets in a canoe, offering his help to other flood victims. Mr. Demme already had firsthand knowledge of the reconstruction efforts in New Orleans, having spent several months filming there for a series of documentaries called “Right to Return: New Home Movies from the Lower 9th Ward.” Through mutual friends, Mr. Demme sent Mr. Eggers a note to say he had enjoyed “Zeitoun,” and optioned the movie rights soon after. The film does not yet have a release date or a distributor, but Mr. Demme said it would be produced by his frequent producing partners Ilona Herzberg, Ed Saxon, and Mark Platt, and that Daniel Pyne, who wrote the screenplay for Mr. Demme’s remake of “The Manchurian Candidate,” would write its script. In an email message, a representative for Mr. Eggers said that the option money for “Zeitoun” was was paid to the Zeitoun Foundation, a nonprofit grant group that distributes money to other New Orleans nonprofits and organizations that promote the understanding of Islam.